Radon is a colorless, odorless radioactive gas produced as a by-product from the decay of radium. Radium exists in varying concentrations in all rocks and soils; however, it is particularly concentrated in granite, shales and soils near uranium deposits. Some of the highest radon levels known occur in the Reading Prong, a granite-bearing geological formation extending throughout eastern Pennsylvania, western New Jersey and southern New York state. Radon is unusual among household pollutants in that it originates outside the home and there are no short-term effects from the levels commonly found in houses. Even in high concentrations, radon itself if harmless and does not make people feel sick. However, it decays into a series of radioactive metals that when inhaled can lodge in the lung tissue. When these elements emit radioactive particles, they can cause lung cancer. Radon may be responsible for 5,000 to 20,000 lung cancer deaths annually in the United States, second only to cigarettes. Most radon enters the house through cracks and holes in house foundations. The pressure difference between the soil and the indoors is the driving force behind radon gas movement. These differences are caused by, temperature and pressure differences, wind on the building and the operation of combustion appliances and exhaust fans. To a much lesser extent, radon enters the home in mineral-containing building materials and in well water. High radon levels are not caused by tightening the home for energy efficiency. Rather, they occur because a house is located above radium-contaminated soils. 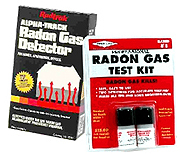 If you are concerned about the possibility of radon in your home, detection kits are available in some hardware store, and some companies offer radon detection services. However, you should check with your utility or with local building officials to see if radon is a concern in your area before investing too much on detection.